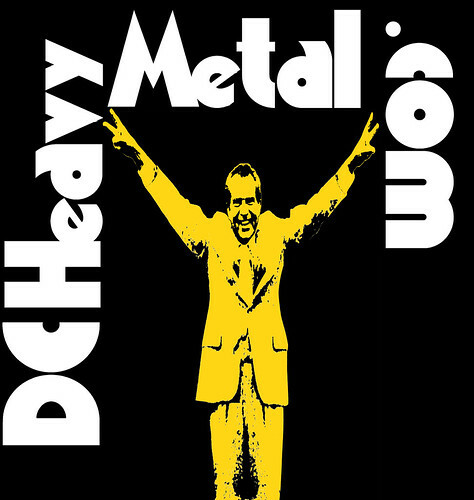 Some of you may have seen me out and about wearing the new prototype for the next DCHeavyMetal.com t-shirt design featuring a parody of the classic Black Sabbath Vol. 4 album cover with Richard Nixon taking Ozzy’s place. From Sleep to Darkest Hour it seems like almost everyone has parodied this design so why not DCHM? 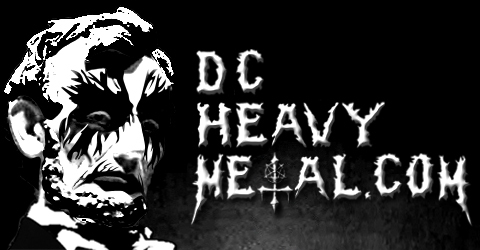 I came up with the idea myself but I think we can all agree that RJ Mahoney did a great job executing the artwork and I think it’s another design that screams heavy metal and DC at the same time. I’m ready to get these out to you guys so starting right now until Monday, Sept 16th we’re going to do a presale for these killer shirts. And you may have heard of this show I’m putting on at the Fillmore on Sept 26th, the DCHM 4th Anniversary Party (details here). If you buy a ticket to the show from DCHM and a shirt with it we’ll have a reduced price for you and the shirt will be available for pick up at the show. Men’s S-XL and women’s (girly cut) S-XL will be $15 each, shipped. If you buy a ticket to the DCHM 4th Annivesary Party from us at the same time, the total will be $22. That’s $5 off! This option is only available for shirt pick up at the Fillmore the night of the show (the ticket will be mailed to you). If you’d like to purchase a shirt and multiple tickets, just add $12 per additional ticket. Add an extra $1 for men’s XXL. Contact me if you need a size larger than that and we’ll work something out. This fee is for both the shipped option or the DCHM 4th Anniversary pick up option. Add $1.50 per shirt if you are paying via Paypal using a credit/debit card (you do not have to pay the extra $1.50 if you paying with Paypal directly from a bank account). This fee is for both the shipped option or the DCHM 4th Anniversary pick up option. If you’d like to purchase a ticket and not a shirt you can do that for $12 shipped (you must order the ticket from me by Sept 22nd to guarantee shipping on time). You don’t have to have a Paypal account to use it to pay. Be sure to include a note in the Message section with whatever address you want the item(s) shipped to and what size you want. If for some reason you don’t send the note properly, just email me from the same email address you made your payment from with the size and shipping info. If you don’t send me the right amount I’m just going to refund your purchase and you’ll have to try again. I should have a few of the shirts in the new design at the show, but they will be more expensive than I’m selling them for here, will be sold for cash only and will be limited to the quantity at the show. I will also be at the Pinch on Thursday, Sept 12th with tickets for sale. The excellent Corsair is playing there that night and it’s a free show too so stop by if you can. Details are listed here.